Tony Boyer dominated the recent NBRSA Nationals, winning the 4-Gun, 3-Gun, and 2-Gun (LV/Sporter) Overalls, and finishing first in other events. While Boyer’s win was proof of his superior wind-reading and trigger-pulling skills, his equipment didn’t hurt. Boyer was shooting Bartlein gain twist, cut-rifled barrels. These barrels featured a twist rate that increased from 1:15″ to 1:14.25″. 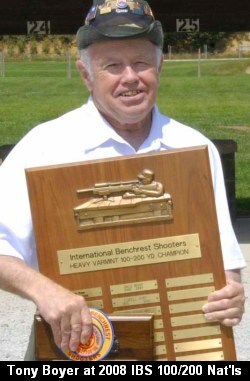 Notably, Wayne Campbell and Mike Ratigan, the second-place and third-place finishers in the 4-Gun, were also using Bartlein cut-rifled barrels (twist rate unknown). This was an impressive showing for Bartlein. It also shows that cut-rifled barrels are becoming the “go-to” choice in short-range benchrest, with both Bartlein and Krieger barrels displaying match-winning performance. Frank Green of Bartlein Barrels told us: “Wayne Campbell did all the barrel fittings for Tony Boyer before Phoenix (NBRSA Nationals) and Kelbly’s (IBS 100/200 Nationals). I know Dwight Scott does work for Tony but not all of it. At Phoenix, Tony Boyer shot all gain-twist-type barrels (in every class). His barrels went from a 15 to a 14.25 twist. At Kelbly’s (the IBS 100/200 Nationals) right before Labor Day, Tony only had gain-twist barrels for his Heavy Varmint, and he proceeded to cream the HV class. At Kelbly’s, Boyer won HV 100 yards, HV 200 and HV Grand Aggregate with a .169 combined Agg. Share the post "Gain-Twist, Cut-Rifled Barrels Shine in Short-Range Benchrest"